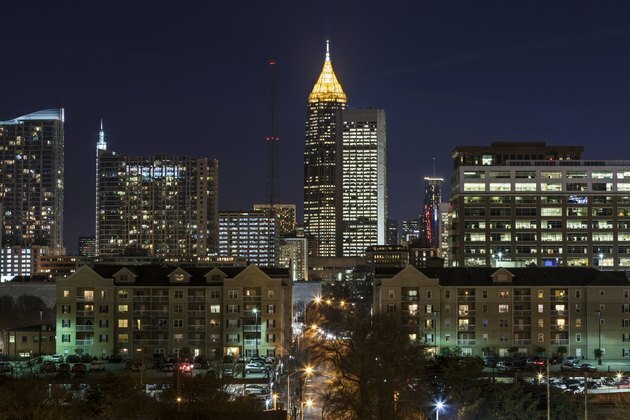 There's more to Atlanta's nightlife than the restaurant, bar and club scene. In fact, some of the city's most popular tourist attractions are open at night, even late into the night in some cases. The major tourist zones in the city are heavily trafficked with visitors and locals alike and generally safe in the evening. Come prepared to have some fun that goes beyond dining and club hopping and may even include putting on your dancing shoes or swim trunks. After opening in 2005, the Georgia Aquarium quickly became one of Atlanta's top tourist attractions. The large aquarium keeps normal daytime business hours, but you can also spend the night. The Georgia Aquarium's sleepovers are a surreal spend-the-night party where you actually bed down inside the aquarium's glass tunnel. Giant whale sharks and other marine life go swimming by just feet away from your head on the pillow. Group, family and adults-only sleepovers are available; all include special activities and a behind-the-scenes tour of the facility. Whether you want formal instruction in a studio or a chance to show off your moves in a club setting, Atlanta has plenty of dancing options. Those yearning to learn the classic steps of the fox trot, the waltz or the cha-cha can sign up for classes at one of the two Ballroom Dance Clubs of Atlanta locations in the metro area. Dance 411 Studios provides evening classes for all age groups and all manner of dance styles, from jazz dancing for kids to pole dancing. When it's time to test your moves out in public, MJQ Concourse is a legendary late-night subterranean dance club where people-watching is as fun as the dancing. SkyView Atlanta is a giant Ferris wheel across the street from Centennial Olympic Park and CNN Center in the heart of downtown. Though it's open in the daylight hours, after dark is the recommended time to ride this 20-story-high wheel in the sky to see the dazzling display of downtown's lights. SkyView stays open until late in the evening; you ride in an air-conditioned, glass-enclosed gondola car, so chilly or warm evenings aren't a concern. The only time SkyView closes is on Thanksgiving, Christmas and during times of lightning or high winds. The centerpiece of Centennial Olympic Park -- which itself is a centerpiece of downtown Atlanta -- is the Fountain of Rings. The dancing waters of the rings light up at night. Best of all, you're allowed to play in this fountain, so bring your swim trunks. Any night when the weather's warm enough, you'll find the fountain area of the park filled with people, especially families with young kids running through the spouting water. A light-and-music show takes place at the fountain four times daily, twice in the evening hours.